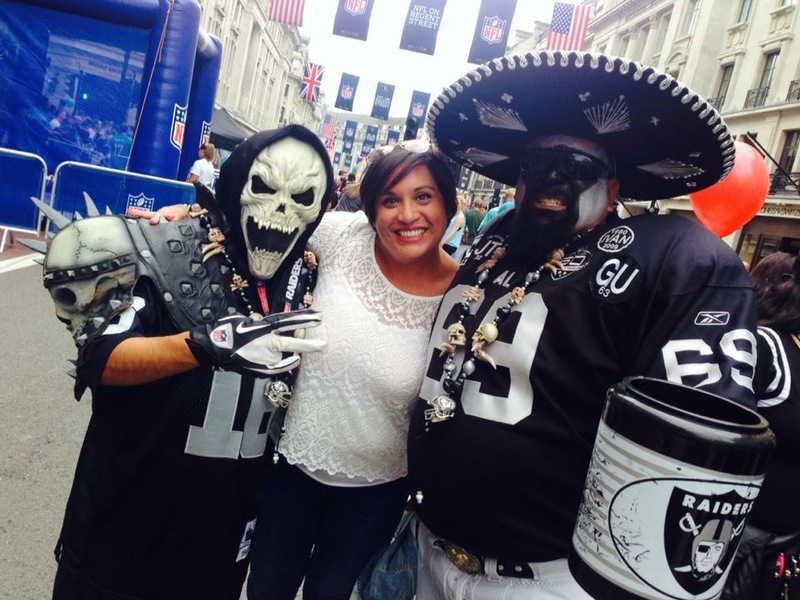 As part of our series in celebrating female NFL fans across the UK, I’d like to introduce you to Kimmi, a Raiders fan. Kimmi shares with us how she got in to the NFL, how she made the choice of her team as well as more about her overall experience as a fan. It was hot. It was damn hot! I sat there in the sunshine with fellow Raiders fans watching us take on Flacco’s Ravens in the Coliseum. We tied the game three times and were losing as we entered the final two minutes, but then Carr came up with the goods and threw it with aplomb right down the middle to Seth Roberts with 0:26 left on the clock. And that was it, I was off! Straight down the stairs and into the Black Hole. I jumped, I bounced, I high fived people and I hugged complete strangers. I even missed Neiko’s interception afterwards as I was too busy cheering with some of my new ‘friends’ in silver & black and thumping my chest. It was a Sunday in January 2011 and it was getting late, my boyfriend, Nic and I got home from watching The Kings Speech at the cinema and he immediately put his new favourite ‘shirt’ on. It was green, white and had the number 21 on it, it was his Jets jersey and he was getting ready for a major game. He had already asked me to watch it with him but after he told me that “the Jets are pretty much the equivalent of Everton FC” (plus I had work in the morning) I decided I wasn’t interested. Later that evening I was woken up by shouting and cheering and as I stormed into the living room to remonstrate about the noise, I was greeted with a barrage of abuse aimed at the TV and something about “Tom Brady got picked off!” and “F*ck the Pats!”. I went back to bed. Annoyed. The Jets won that night and he was happy all week until they lost to the Steelers in the following game. Again, I considered following the sport but…. the equivalent of Everton? LOL No thanks! I did kind of follow it because he did and started to admire the Chicago Bears kits… sorry… uniforms as they had a nice stripe down the side of the pants. He’d watch the games on Sky Sports and so would I and then it came to pass that in September 2014, the Raiders would be coming to London. He asked me to meet him in Piccadilly Circus the day before the game as there was a bit of a ‘do’ on in Regents Street and that’s when I felt the calling. The area was filled, not only with die-hard fans, but with people of all cultures, ages, families and women… This might seem a peculiar thing to write, but I was a follower of Chelsea FC and I was used to going to events/matches which essentially had the ‘lads crowd’ full of beer swilling, Phil-Mitchell-from-Eastenders-looking, pot-bellied louts. This felt different from the start. I remember arriving at Regent Street on the bus and seeing (who I now know to be) Crusader Raider and Crossbones Kelly and loving their outfits, I met up with my other half and proceeded through the throng of attendees. What amazed me was that so many Americans were there in their gameday wear and makeup, not only Americans but Europeans too. This was a major attraction and instead of designer clothing worn out of high-end stores, a sea of NFL jerseys inundated the half-mile stretch of road. In fact, in just a short time, it was possible to see fans wearing attire from all 32 teams. I had photos with the three Lombardi trophies, yet at the time I wasn’t aware of how much of a big deal that was, I had a go at throwing the ball (badly LOL), I got to see Hall of Famer Fred Biletnikoff on stage and watched the Raiderettes strut their stuff. But it was seeing the other Raiders fans with their ‘I don’t give a f*ck’ attitude that resonated with me. Some of them seemed a bit scary, a bit ‘take me as I am’ and not seen as ‘the norm’ kind of people. I liked this. I LOVED it! But it was meeting super fan Sénor Raider and having my photo with him (whilst not realising he was part of the Black Hole) that essentially made my mind up that I was to be one of them and from that moment on I was a Raiders fan. Sorry Nic but I think it’s safe to say that at this point I already knew that the Jets well and truly sucked. Since then I have attended games at Wembley and Twickenham in all my regalia. I have met fellow UK, European & American Raiders fans, I’ve met Neil Reynolds, Jeff Reinebold, Roger Goodell (don’t @ me), Peter King and players from many teams past-and-present at NFL UK events, whilst also being luckily enough to twice get up on stage and participate in games/comps. I met David Hasselhoff at a Fins/Jets game and I loved it but I think it was more recently that I felt the passion for the team, when it was announced that they would be coming to London again to play the Seahawks. I felt stressed about getting tickets as for some reason, it was decided that the game was to be played in the reduced capacity venue that is Tottenham Hotspur’s stadium. Thankfully that was alleviated when Nic secured two in hospitality… only for the game to be switched to Wembley and the fear returned. No issue though as we opted for two £700 Club Wembley seats, this was the Raiders and I didn’t care how much it cost. I was ecstatic to get to go see them on ‘home turf’ in hospitality and thought about the big day for months beforehand. I also wanted to get involved with fans prior to the game too and booked onto many of Silver & Black UK’s events. I wandered down to the Admiral in Trafalgar square on the Thursday and met some amazing & wonderful fans from Cali, on the Friday though it was the pre-game party and I got a bit nervous beforehand as going to attend some of these happenings on my own and not knowing anyone gave me the jitters. Let’s not forget too that I am still a rookie when it comes to the game and I would not know a Philly Special from the post route, so if anyone started chatting Xs & Os then I might’ve been in a spot of bother. There was little need to be nervous though as the Raiders fans I met were genuinely nice people, very welcoming and I was truly made to feel part of the Raider Nation. It really is a family and at some point I was even gifted a cigar from Violator (another Black Hole die hard fan). In the build-up to the game I met the Raiderttes, rode on Madhatter Raider’s open top bus tour around London with my new friends I call my LA Crew and got photos with Fred Biletnikoff & ex-Raider Darren McFadden. Saturday was fun as Nic and I visited The Argyll Arms in Oxford Street for drinks and once again, the well-known fans from the US were in attendance. A fantastic day once again. On the day of the game I met up with the LA Crew and Silver & Black UK, the former includes some ladies I have kept in touch with since they returned to America and hope to meet up with them again one day…perhaps in Las Vegas? I was surprised at how many Seahawks fans were in attendance, especially in the hospitality area where I felt like a VIP. A lot of US fans I met there were genuinely surprised and happy to experience the UK fans and our passion for the game. The game itself was a washout for Silver & Black but it wasn’t going to dampen my spirits (especially as I had consumed quite a few LOL) and I had experienced one of the best weeks ever! 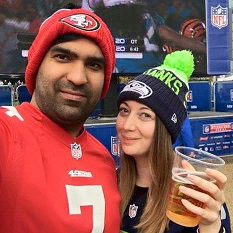 27-3 was the result in favour of Seattle and yes I was perturbed by the number of non-Seahawks fans cheering for them, Raiders really are the team everybody loves to hate. But do I care? Hell no! I’m a Raider… and I don’t give a…!